There are approximately 206 bones in an adult and each bone is an organ composed of a number of tissues. Bone tissue forms the bulk of each bone and consists of both living cells and a nonliving matrix formed primarily of calcium salts. Other tissues include cartilage, blood, nervous tissue, adipose tissue, and dense irregular connective tissue. There are six basic types of bones based on their shapes. Short bones are the bones within the wrist and ankle and they possess a small, boxy appearance. Long bones possess a long, skinny shape and are found in the upper and lower limbs, with the exception of the wrists, ankles, and patella (kneecap). Sutural bones are small bones that form within the sutures of the skull and they vary in number and location from person to person. Certain skull bones, the ribs, and the sternum (breastbone) are classified as flat bones, meaning they are thin, flat, and slightly curved. Irregular bones, such as the vertebrae (spinal column), coxal bones (hip bones), and some skull bones, possess irregular shapes with numerous projections. Sesamoid bones are unique because of their sesame seed shape and the fact that they form inside muscle tendons. The patella is a sesamoid bone. The femur, the bone of the thigh, will be used as an example in considering the structure of a long bone. Refer to as you study the following section. At each end of the bone, there is an enlarged portion called an epiphysis (e-pif’-e-sis). The epiphyses (plural) articulate with adjacent bones to form joints. The articular cartilage, which is composed of hyaline cartilage, covers the articular surface of each epiphysis. Its purpose is to protect and cushion the end of the bone, in addition to providing a smooth surface for movement of joints. The long shaft of bone that extends between the two epiphyses is the diaphysis (di-af’-e-sis). Each epiphysis is joined to the diaphysis by an epiphysial (growth) plate of hyaline cartilage in immature bones or by an epiphysial line, a line of fusion, in mature bones. formation and repair of bone. Tiny blood vessels from the periosteum help to nourish the bone. The internal structure of a long bone is revealed by a longitudinal section. Spongy (trabecular) bone forms the internal structure of the epiphyses and the internal surface of the diaphysis wall. It consists of thin rods or plates called trabeculae (trah-bek’-u-le) that form a meshlike framework containing numerous spaces. The trabeculae are covered by a thin connective tissue membrane called endosteum (en-dos ‘-te-um) that is involved in forming and repairing bone. 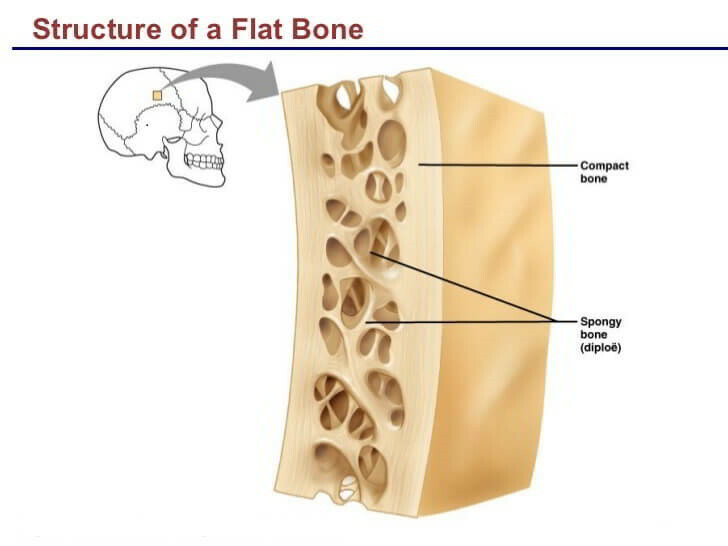 Spongy bone reduces the weight of a bone without reducing its supportive strength. In an adult’s long bones, red bone marrow fills the spaces between trabeculae within the proximal epiphyses of the humerus and femur. In other epiphyses of the limbs, the spaces between trabeculae are filled with yellow bone marrow, which is composed of adipose tissue. Compact bone forms the wall of the diaphysis and a thin superficial layer over the epiphyses. As the name implies, compact bone is formed of tightly packed bone that lacks the spaces found in spongy bone. Compact bone is very strong, and it provides the supportive strength of long bones. The cavity that extends the length of the diaphysis is the medullary cavity. It is lined by the endosteum and is filled with yellow bone marrow. As noted earlier, there are two types of bone: compact bone and spongy bone. When viewed microscopically, compact bone is formed of a number of subunits called osteons. An osteon (os)-te-on) is composed of a central canal containing blood vessels and nerves, surrounded by the lamellae (singular, lamella), concentric layers of bone matrix. Bone cells, the osteocytes (osAe-o-sitz), are arranged in concentric rings between the lamellae and occupy tiny spaces in the bone matrix called lacunae. Blood vessels and nerves enter a bone through a nutrient foramen (fo-ra’-men; plural, foramina), a channel entering or passing through a bone. The blood vessels form branches that pass through perforating canals and enter the central canals to supply nutrients to the osteocytes. Canaliculi the tiny tunnels radiating from the lacunae, interconnect osteocytes with each other and the blood supply. The trabeculae of spongy bone lack osteons, so osteo- cytes receive nutrients by diffusion of materials through canaliculi from blood vessels in the bone marrow surrounding the trabeculae. The structure of the other bone types is like that of the epiphyses of long bones. Their external structure is a thin layer of compact bone covered with periosteum; the internal structure is spongy bone covered with endosteum. In most of these bones, red bone marrow fills in the spaces between the trabeculae.